AdWords Change: RIP Right Side Ads! No right side ads on Google any more: Google recently rolled out a change in its policy for paid advertising showing up on desktops: It killed the right hand ads and add a fourth advertising space in top of the organic results (the fourth ad will appear mostly in “highly commercial“ keywords). The total amount of advertising on Google search result pages comes down from formerly 11 to now 7: Up to four in the top and up to three in the bottom of the SERPs. Why did Google remove the right site ads? The overwhelming majority of paid clicks come from ads above organic results. According an analysis by WordStream from January 2016, the right side ad and bottom ads account only for 14.6% of total click volume. 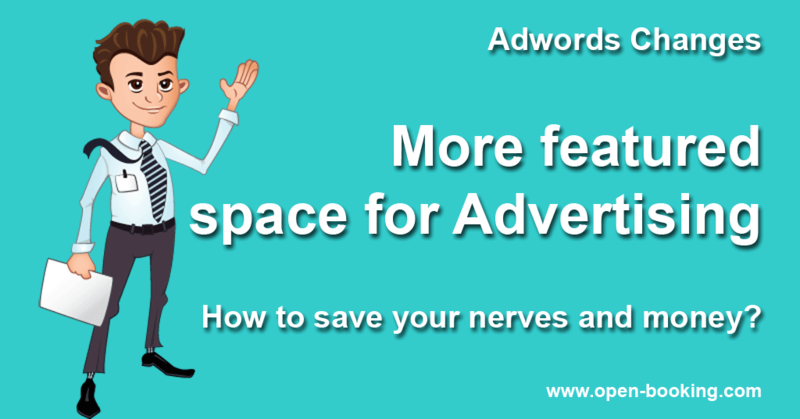 Google just removed not effective ad space. Adding a fourth space in top will just claim some additional clicks from organic search? Google itself might benefit the most of this move. Higher CPCs can be the outcome of a bidding war for the first four positions. Good for Google, expensive for the advertiser. The advertiser will appreciate, that the total of available clicks will rise. Users do not distinguish between paid and organic search results. They just click on the first results. Who will be the loser? The loser is organic search which is gone from above the fold space on desktop for any commercial query. Looks like a bad news again for the online marketers relying on SEO. The changes will most probably not affect long tail keywords which are not “highly commercial”. As independent Owners and managers we’re facing the high presence of the big listing-sites (OTAs) in both, paid and organic results, since years. This Google change will not make things better for us. Nevertheless, Google Adwords and of course the organic search results are important tools for our marketing. The amendments relate to our niche and are reason to think about the next steps. What does it mean for vacation rental marketers? SEO becomes harder for our competitive keywords. We’ll have to look for our SEO-traffic away from the major roads of “highly commercial” phrases. The long tail search becomes more important. There is more reason for us to use paid ads if we want traffic from Google. Well – that’s Googles aim with that change. PPC may become more expensive for our competitive keywords and phrases. We need to bid for the first four ad spaces– and come into competition with the “Big 4 of Listing Sites” and other OTAs. Conversion matters. If advertising on Google or SEO is getting more expensive, we need to ensure that your vacation rental website converts better to have similar results. Branding becomes more important. If people start to search for our brands rather with global “highly commercial” keywords, we’re out of the hamster wheel of increasing prices. Small changes can have a big impact. Google for sure is not made to support our business. It is one channel in our marketing mix. We can use the actual changes in Google Adwords to review other elements of our marketing mix. Any idea, how we can even gain from this changes? What is the problem with your website?